Yesterday this sweet little angel was brought into the shelter by one of our Humane Officers. I have to say, she’s the best puppy in the world. She’s around 3 months old and weighs in at about 18 lbs full of sweetness. Sad news, Elley is going to need her front right leg amputated. She has an old injury that, unfortunately, was not taken care of when it originally broke. Luckily, nothing can stop little Elley from being the happiest dog in the world. This is a dog that will truly teach you something about life. She’s gone through some rough times, but has the most positive attitude towards life. Nothing can stop her. So, if you’re looking for a pup that teaches you life lessons, on top of being the most amazing companion, then check this girl out. She’s currently looking for her forever home at Griffin Pond Animal Shelter. 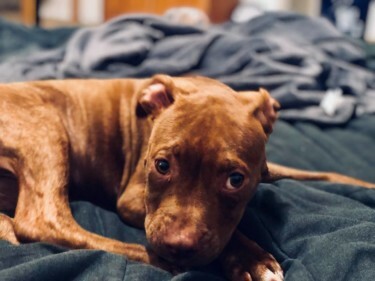 How can you resist this pibble face?